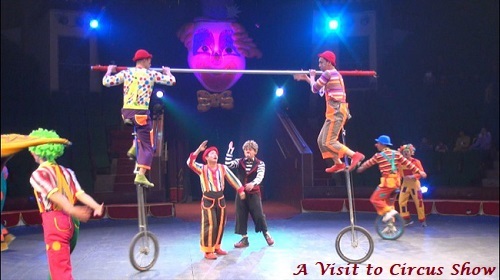 A circus show has much greater attraction and charm for the children than for the grown-ups, but it provides joy, entertainment and recreation for all. The feats of men and animals are worth seeing. The clowns provided a lot fun and entertainment. One fine day while going to the school, we saw big poster pasted on the walls, announcing the arrival of the Grand Arvind Circus to our city. We saw big tent being pitched in the parade ground. I made up my mind to see the show on the very first day. My friend, Vijay accompanied me. Seating arrangements had been made under a huge canopy. We had got two chairs as near the arena as possible. More visitors poured in soon and the canopy was fully packed. The show began with the appearance of two clowns’ dressed multi-coloured clothes. They made jokes and played such tricks on each other that none could help laughing. Then the gymnasts came. They showed wonderful and awe-inspiring feats. After this came some cyclists. All were riding on one wheel. They also performed many interesting feats. One of them who rode a bicycle did paddling with hand instead with feet and made it run very fast. They were followed by two ladies who danced on the fine steel wire. They had umbrellas in their hands to balance the body weight. Then came four horses with four young men dressed in white, riding on their backs. The band began to play and the horses went round dancing in a tune to music. The band stopped and the riders stood up on the back of their horses which at once began to gallop. And the horses galloped, the riders jumped from horse to horse. They would stop all of a sudden and then break into gallop again. They were followed by two elephants that played their wonderful tricks by turning in the midst of loud cheers. One elephant stood on his legs, putting the other two on a big stool and saluted the audience with his trunk. Then he held a book on his trunk and seemed to read it. After some time and last of all came two lions in their cages. As the door of the cage was opened they rushed out with a great roar. We were greatly frightened to bear their terrible roars, but the well-dressed ring master with a whip in his hand stood calm. He ordered them to do many an odd job and it was a marvel to see they dare not disobey him. If ever they hesitated to do his bidding, he whipped them like beasts of burden. The lions were made to pass through ring of fire and to drink with lamb from the same vessel. The lambs were also made to go over the bodies of the lions. It was, perhaps, their greatest achievement. When the show was over, some boys and pretty girls came their and sung the National Anthem, All were stood up while National Anthem was being sung. It was really a grand show and we had a jolly time there. The show was over a mid-night and we returned home. We thought our time and money well-spent.